Ugadi is one of the great festival for the Hindus of Andhra Pradesh and Karnataka state of Indian subcontinent. Ugadi is not only celebrated in these two states but the day is also equally important for the Hindus of Maharashtra. For all these states, this day is celebrated as the New Year day having a name as 'Ugadi' in Andhra Pradesh and Karnataka and 'Gudi Padwa' in Maharashtra. Literally the word Ugadi means ‘Aadi or the beginning’. It is celebrated every year in between March to April. This is the time when the nature is also in celebration mood. This time marks the onset of Spring. There are new leaves and new buds on the trees. It appears that the nature is equally happy like the humans and is all ready to welcome the new year. On this day, people worship God in a ritualistic manner and start the New Year with the blessings. Apart from performing puja, sweets and other delicious dishes are prepared and distributed to make this festival a grand success. Such dishes are ugadi pachadi (a mixture of neem buds, raw mango, tamarind juice, green chilli / pepper, jaggery and pinch of salt), puran poli, pulihora, carrot payasam, poha ladoo, lemon rice, Poha Kheer etc. 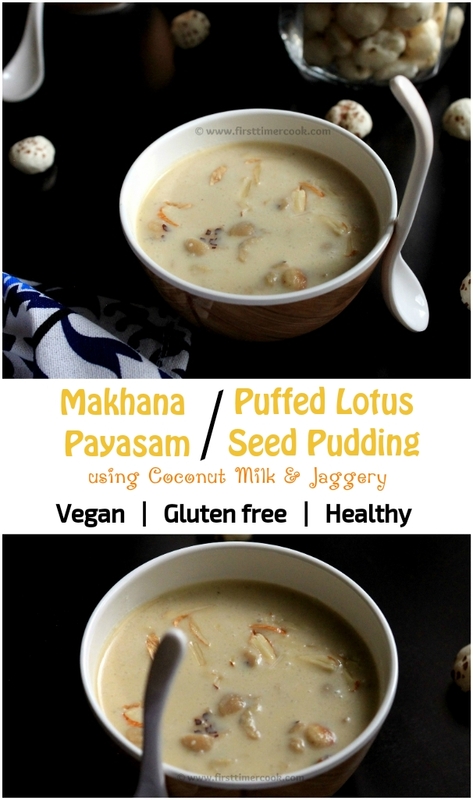 With Ugadi festival just around the corner, I am here sharing a vegan and gluten free pudding or payasam as Makhana or puffed lotus seed payasam using coconut milk and jaggery for the celebration. Makhana, also known as fox nuts are rich in nutrients like calcium, iron, zinc, protein, phosphorous which in result make this a healthy food. So its good to include these puffed lotus seeds in our diet. 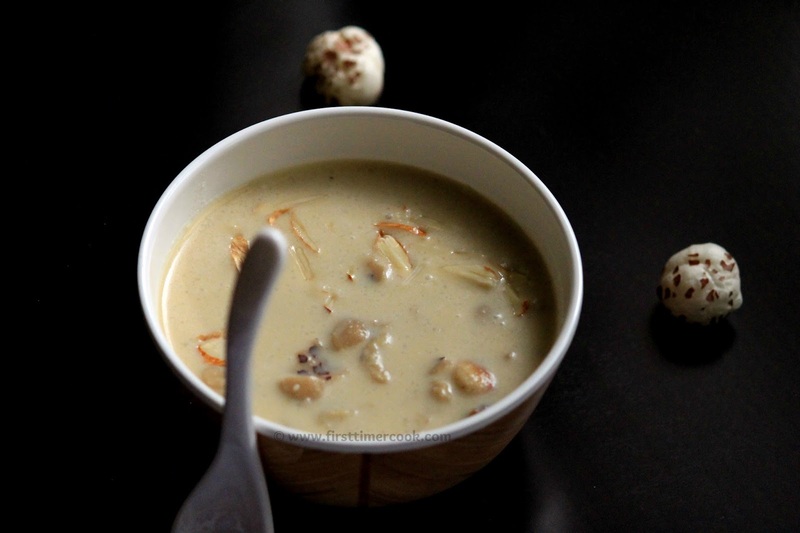 Makhana kheer is often prepared as fasting foods during festivals like Navratra, Ekadashi etc. This time, I have preferred to make the kheer completely healthy, vegan and gluten free. One point to remember is that since coconut milk is being added here in the dish, so after addition don't overheat the payasam. Othewise the milk starts to curdle when cooked at high temperatures. 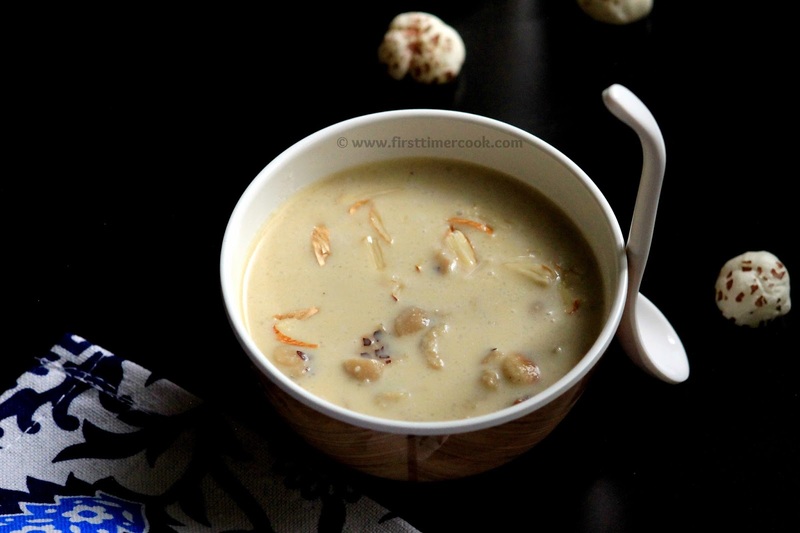 This payasam / kheer is quite easy to cook and taste even yum when served hot, warm or cold. So do try this Makhana Payasam or Puffed Lotus Seed Pudding (using Coconut milk & Jaggery) and give your valuable feedback either in the comment box below or tag me as #firsttimercook on Instagram. Lets go in details method of preparation. First roughly chop all the lotus seeds or makhana and keep aside. Heat oil in a pan and fry cashews, raisins until the raisins bubble up and become light brown in color. Drain all the fried nuts from oil and keep aside. Next add all the roughly chopped makhanas to the same pan and fry until crisps with continuous stirring. Turn off heat, transfer the fried makhanas to a plate and keep aside. Put water, jaggery to the same pan and turn on heat. Soon jaggery will start melting. When jaggery is dissolved completely, turn off heat and strain the jaggery syrup to remove any impurities. Add fried makhana to the syrup. Stir and cook for 3-4 minutes over low-medium flame. Next add cardamom powder, fried nuts and mix everything well. Finally add coconut milk, give a quick stir till well combined and then turn off heat. Serve this makhana / lotus seed kheer using coconut milk warm or chilled ! Makhanas can be ground to a coarse mixture after frying. In this case, the final consistency of the kheer will be a bit thick. So adjust accordingly the thickness by adding water if desired. Else grind half of the makhana into coarse mixture and keep rest as it is. This 'Makhana Payasam or Puffed Lotus Seed Pudding (using Coconut milk & Jaggery)' is contributed for 44 Healthy Wellthy Cuisines where the theme is 'Ugadi Special'. Here are more similar recipes shared by our Healthy Wealthy Group members as Puliyogare / Spicy Tamarind Rice, Rose coconut fudge / Gulab Nariyal Ladoo, Konkani style Avnaas Amba Saasam, Puran Poli. Sasmita Makhana payesh is my favourite, but have never tried with coconut milk and jaggery before , such an interesting share will try your lovely recipe soon. Lovely dish with minimal ingredients but fabulous taste!! 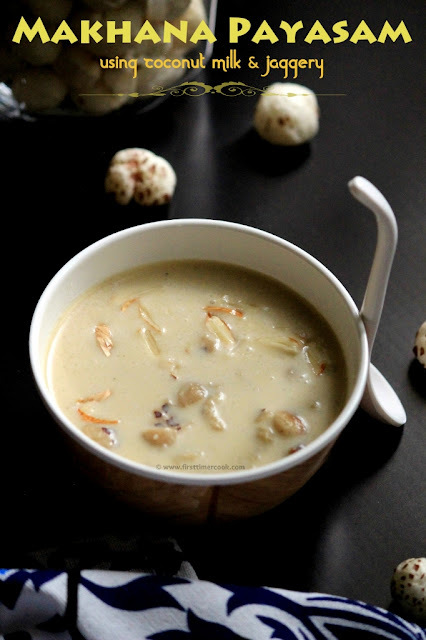 Love the idea of using makhana in jaggery kheer; love it dear :) Looks scrumptious and tasty! Happy Ugadi!! Awesome kheer ,Can be made instantly and kids will love this.. In my to do list .. I love kheer. But, have never tried it with makhana. Interestingly, I have a packet of makhana that needs to be used. Wow, that is such a quick and easy to make payasam. I've never made sweet dishes with makhana -- this sounds to be a great one to try. Love anything with kheer. Interesting recipe with Vegan touch. I like makhana but have not used it to make kheer. I like this recipe as its much healthier. Interesting Payasam. I have never tried Makhana in sweets but this sounds delicious. Will try sometime. Thanks for sharing ! Sounds so good with coconut and jaggery. Puffed lotus seed is new to me.Looks delicious. I have been wanting to make this kheer for ages now. Thanks to you can try making it vegan. Looking at the gorgeous clicks and the recipe I can only imagine how tasty that bowl of payasam would be. Makhana combined with coconut milk and jaggery all healthy ingredients to make a humble sweet dish for the festive season - Perfect!! I am a big fan of Makhana and snack on them every single day. Protein rich and am sure it tastes amazing in a sweet dish too. I really like this recipe and method of using jaggery. Such a gorgeous and tempting payasam and that too Vegan! 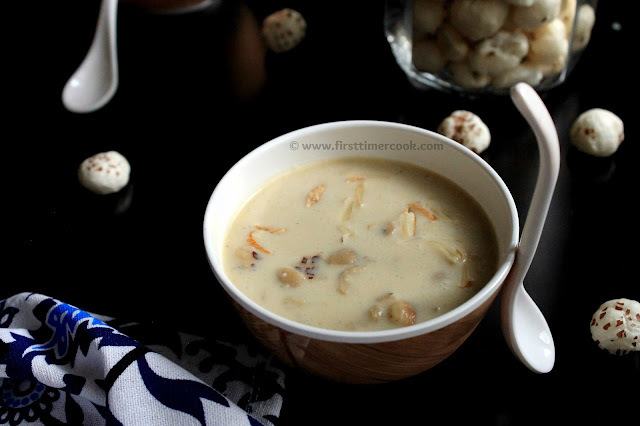 Delicious Payasam Sasmita!A wow share! Makhana kheer is quite our family favourite, and that bowl of kheer is seriously very pleasing, love that you have prepared this kheer with coconut milk. Now am tempted to give a try to this coconut milk makhana kheer. Makhana kheer, I do need to try sometime. But first, I should search where will I get it here. Looks delicious. I love makhana kheerr it looks so rich and delicious. I too make makhana kheer but I have not used jaggery to sweeten it.Looks very tempting. I do make makhani kheer with jaggery but never tried with coconut milk..your version sounds more flavorful ..will give it a try soon Sasmita ! Makhana payasam sounds interesting.Using jaggery is good substitute for sugar.